This striking blazer has more of a tapered cut than the photo implies. My camera makes it look boxy. The indicated size on this is 38, but it measures and fits me like a 34 or 36 chest. The length in back from the bottom of the collar to the bottom of the jacket is a hair under 30". The shoulder area is not that large, probably a men's small or teen fit. The sleeve length is 32". 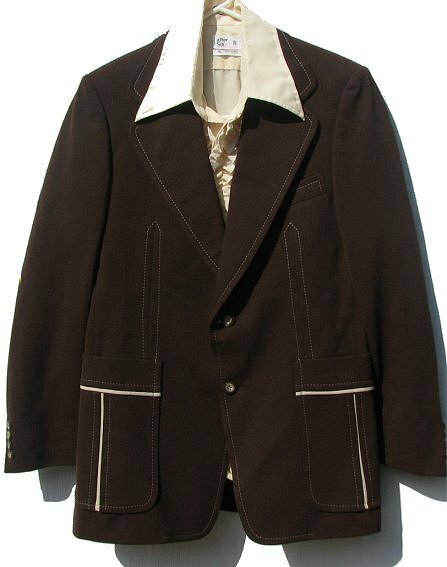 The blazer is a true chocolate brown accented by cream contrasting stitching and cream trim and inserts on the pockets. It's in mint condition. I can't tell if it's ever been worn. it well that can be purchased with it below.